Cooking and food adventures by Lois Parker: gluten free cooking that brings back that AAHH! moment as your teeth sink into something scrumptious. Quinoa is a very nutritious food, being a complete protein, but it can have a rather acrid flavour. This is caused by the coating the seed has to discourage insects from eating it. If you rinse whole quinoa you can get rid of this. 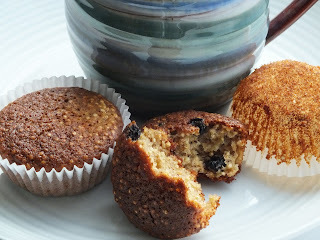 I have used rinsed quinoa in these muffins, which I then toasted to a light brown before adding to the flour. The whole quinoa gives a crunchy texture. If you don't want this blitz the quinoa in a blender to get a smooth texture. These muffins turned out to be quite sweet. You may want to reduce the sugar. Makes about 16 small muffins. Use cupcake paper cases to line your tins to make things easier. Whisk the flour and baking powder together then stir in quinoa and blueberries. Mix mashed banana, oil, sugar and eggs. Spoon into paper cases - no more than 2/3 full. Bake for about 15-20 minutes until brown on top. Tip onto a cooling rack to avoid a soggy bottom. Freeze as soon as cold for an easy snack.